TORRANCE, Calif., Nov. 30, 2007 -- LEDtronics has released a DC-to-DC dimmer for LED lighting that supports 5- to 40-V applications — up to 2 amps or 24 W (part number LED-DIMMER-001) such as LED strip lights, bulbs and floodlights. The maximum load per dimmer is 24 W, with a dimming range is 0 to 100 percent of input. Input can be between 5 and 40 V DC, and output voltage is continuously adjustable between zero and full-on. dimmer.jpgThe dimmer operates on minimal no-load current (10 to 15 mA), so no extra load is added to the lighting circuit. 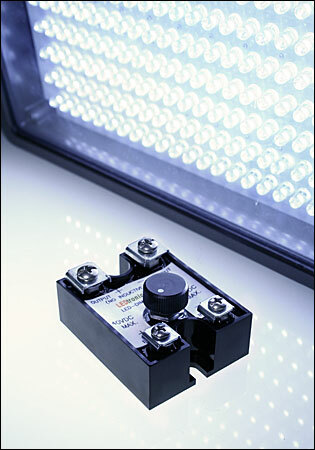 Power dissipation of the dimmer’s drive circuitry is less than 0.7 W.
The dimmer can drive up to 2000 standard white discrete LEDs or 50 high-flux LEDs, and one unit can dim the supplied power for an entire lighting channel (up to 2 Amps, 24 W maximum) of LED bulbs, floodlights, tube lights and light strips. It can be used with 12 V DC solar power systems or connect directly to 120 V AC- to 12-V DC transformers. It is not intended for use with induction devices such as motors. Designed for panel or rack installation or for stand-alone use, the dimmer is 2.3 (58 mm) by 1.9 (48 mm) by 1.1 in (28 mm) (excluding knob). Price per dimmer, including a two-year warranty, is $59.95. OEM and MRO quantity discounts are available (availability is stock to 4 to 6 weeks).